The Austrian Tirol region is home to more than 80 ski areas and they come in all shapes and sizes, but some are more popular with us Brits than others. When you think of Austria’s famous Tirol ski region in the west of the country your first thought may be of cosy villages with lights twinkling out invitingly from their traditional chalet-style buildings, whilst up above, there are endless kilometres of piste carved down through the wooded valley scenery. That’s all very true of course, but in fact there are different types of ski resorts in Tirol to those traditional villages. If you fancy a city break with access to high altitude glacier skiing on your lift pass? Well you could base yourself in the province’s capital Innsbruck. Or are you wanting to party all night as hard as you have skied all day? Then there are several options here but perhaps Ischgl is the most famous. How about some legendary steep and deep powder? That would be St Anton. Ischgl: Open from November to May, partying every night. Ischgl is a ski resort like no other. Boasting one of the world’s longest ski seasons, it all begins with a bang in the form of the big ‘Top of the Mountain’ music concert in November. It then never really lets up until the following May, when it goes out with a bang once again, and another big music concert. 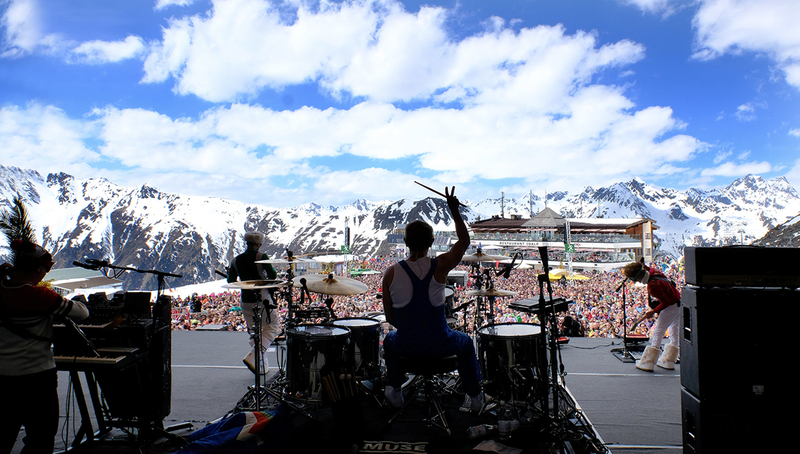 When we say big we mean BIG – Elton, Kylie, Robbie, Led Zep and many others have headlined Ischgl. The long season is in part thanks to lifts rising up to 2800m high above the village and there’s also a mighty snowmaking arsenal covering much of the area. It’s big too, with 239km of runs stretching over the Swiss border to duty free Samnaun. Throw in an amazing après-ski scene, some designer shopping and a Michelin-starred restaurant and you have a very special resort indeed. The Tiroler Zugspitz Arena is made up of seven picturesque villages located in the north of the region. 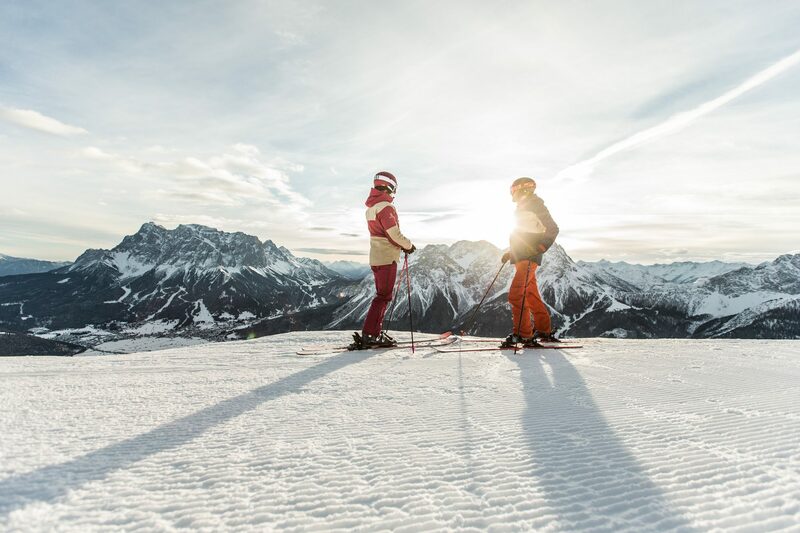 This is the Tirol we all know and love with charming, intimate and atmospheric resorts that are perfect for family ski holidays together. Ski trips here are so good that you’ll never forget them. Altogether there are 142 km of ski runs to explore in the region and whilst the majority of the terrain is easy or intermediate level which everyone can enjoy, there are more challenging slopes too along with freeride opportunities – should you have a bit of a daredevil in the party. Your perfect day here could begin with a full morning on the slopes, then later enjoy a great lunch in a cosy mountain hut, then rounding off your evening with a spot of tobogganing on a floodlit run. Or you might prefer to just kick back and soak up the amazing natural beauty of this region all day long. If one snow-sure high-altitude ski resort isn’t enough for you how about two? Neighbouring Obergurgl and Sölden in the Ötztal Valley both have strong, individual personalities but also complement each other perfectly. Obergurgl-Hochgurgl is the highest traditional resort in Austria and has one of its longest ski seasons, being one of the first in the country to open its 110km of runs for the ski season around mid-November each year. You’ll find a remarkable motorcycle museum in one of the lift stations here and at 3080m the incredible Top Mountain star restaurant. Sölden meanwhile has twin glaciers and opens for skiing as early as September, staging the first races in the annual World Cup calendar by late October. It too has a cool restaurant, this time the stunning glass cube known as the ice Q restaurant, which featured in the last James Bond film, Spectre. A new permanent audio visual 007 exhibition opened in the summer here too: Elements. Innsbruck, the capital of Tirol region, is a vibrant and bustling small city with a compact, ancient centre. The mountains tower up all around this cultural metropolis which has twice hosted the Winter Olympics and its only a short drive from the city’s hotels to more than half-a-dozen great ski areas that surround it. Indeed you can even hop on a funicular railway then cable car to the freeride ski area of Nordkette from the city centre. Other areas nearby include Igls, home of the Olympic downhill run where Franz Klammer’s name became immortalised; Axamer Lizum where the Ladies’ Olympic downhill course is located; Patscherkofel and Muttereralm – both popular with families and beginners thanks to their gentle tree-lined runs and snow-sure Kühtai. All are included on an area lift pass which also includes a bus connection from city centre to the ski slopes, as well of the eternal snow slopes on the nearby Stubai glacier. But you’ll want to save time to explore the university-city itself with its historic buildings, great shopping, excellent restaurant choice and lively nightlife – in fact you can do the full city break AND go skiing in a different resort every day. The icing on the cake is that it’s all just a short hop from the airport of course so you can be on the slopes just a few hours after taking off from the UK. The Ski Juwel ski area is in some ways one of the newest in Tirol, in others it is many years old. That’s because the region was created when two of the most picturesque valleys in the region, Alpbachtal and Wildschönau, decided that after 50 years of operating separate ski areas on either side of a mountain ridge, they’d join them together with lifts and runs to create one of the 10 biggest regions in Tirol. The result? … there’s now one big ski region with 109km of piste offering lots of family-friendly terrain but also some challenging black runs and exciting freeride opportunities that a local guide will be able to take you to. The village of Alpbach has been voted the most beautiful in all of Austria in the past and the villages of Wildschonau Valley including Auffach, Oberau and Niederau are very similar with their wooden chalets set against the beautiful backdrop of the mountains, so it’s hard to go wrong wherever you choose to stay. Add to the offer some highly regarded ski schools, fun off-slope activities and a strong heritage of producing great local cuisine and it’s easy to see how the Ski Juwel got its name and why it’s so popular. 6. SkiWelt Wilder Kaiser – Brixental: So big you never need ski the same run twice! Most of the more popular ski areas in Tirol offer enough skiing to keep you entertained for at least a week, but with the SkiWelt Wilder Kaiser – Brixental the ski area has really XL dimensions, in fact it is one of the world’s biggest with 284km of piste served by 90 fast, modern and comfortable ski lifts. Of course that means that if you like to whizz around seemingly endless slopes clocking up the kilometres, it’s the perfect choice for you. Even if you prefer to take things at a more leisurely pace, the region is keen to point out there are no less than 77 mountains huts available for a quick pitstop or a more leisurely lunch. 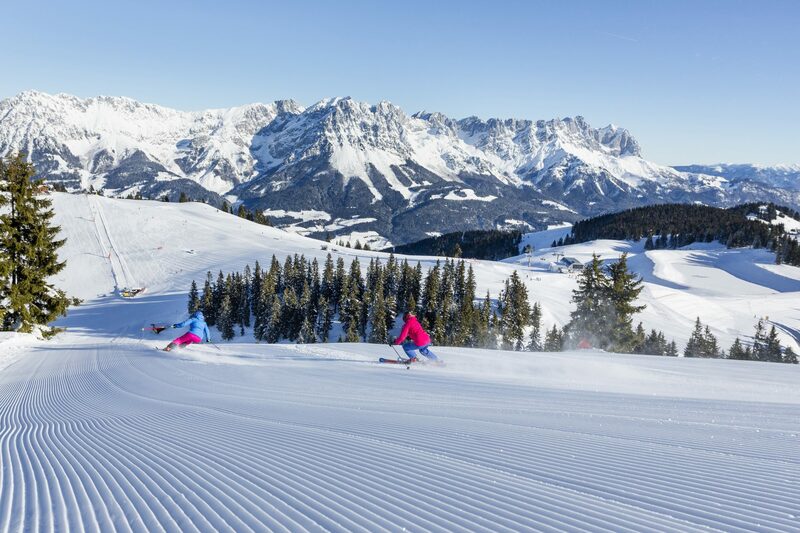 Spread across the rolling mountains of the Kitzbüheler Alps, the ski area inter-connects the skiing above nine Tirolean villages, so wherever you choose to stay you can access the same huge area, and it’s all very easy to get to, just an hour from either Innsbruck, Salzburg or Munich airports. The wide and well-groomed slopes are perfect for beginners and intermediates, and there are also four terrain parks are freestyle fun. If you’re worried you’re not skiing enough in the daytime this is also Austria’s largest night-skiing area. St. Johann in Tirol in the Kitzbüheler Alps has been drawing British skiers to its friendly ski slopes for more than 70 years. Today there are 43km of runs served by 17 modern lifts making it perfect for beginners and intermediates, but you can also buy one of the regional passes for a few Euros more that provide access to dozens of neighbouring ski areas on the same ticket. But St Johann’s slopes shouldn’t be underestimated by good skiers either, behind that family-friendly reputation and those tempting mountain restaurants renowned for their delectable local cuisine you’ll find very challenging, kilometre long black runs too. In any case St. Johann is about more than skiing and snowboarding. There’s the historic town centre with its enticing shops and cafes to explore, and you a get out in to the beautiful countryside surrounding the resort by winter hiking, cross-country skiing or snowshoeing. Part of Austria’s biggest ski area, St. Anton is where it all began – the first downhill skiing in the style we use today was perfected here more than 100 years ago. Now one of the great names in world skiing, it’s most famous today for its challenging off-piste terrain and also for the full-on après ski party scene that accompanies it. But there is a softer side to St. Anton, although it gets little publicity, with a whole separate mountain of predominantly easy and intermediate level terrain. 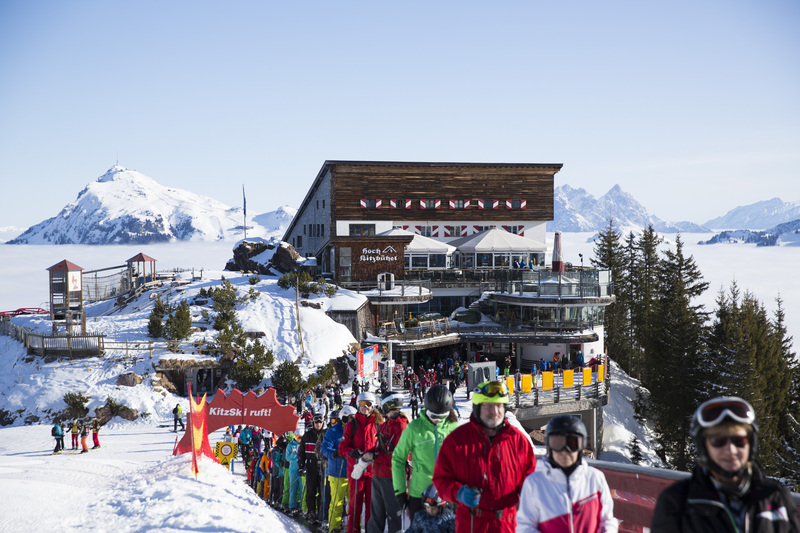 Whatever your ability though everyone can be an expert après skier with the slopeside bars busy from 3pm every evening – get in early if you want to grab a table. Another resort that’s world famous and known well beyond the skiing world, Kitzbühel, with its ancient heart, picturesque scenery and cosmopolitan mix of accommodation, shopping and dining is a popular holiday destination year round. There’s even a casino. But Kitzbühel remains a ski resort in its DNA and sits at the heart of a great ski region that extends for almost 100 miles of ski slopes, open from October to May for a 200 day ski season. Every January the resort reaches an even higher level when the world’s bravest and best skiers active to tackle the most famous downhill run on the World cup circuit, when the Hahnenkamm race, the Grand National of ski racing, takes place on the town’s Streif run, the biggest event in Austria’s sporting calendar, summer or winter. Skiers reach up to 140 kph as they almost fly down the technical, extremely challenging course as they have done for more than 80 years now. State-of-the-art lifts, endless pistes and terrain for every level make Mayrhofen a staple favourite with Brits for generations. Easy to reach, filled with lovely family-run hotels along with great restaurants and bars, set in the stunning scenery of the Ziller Valley, what’s not to love? 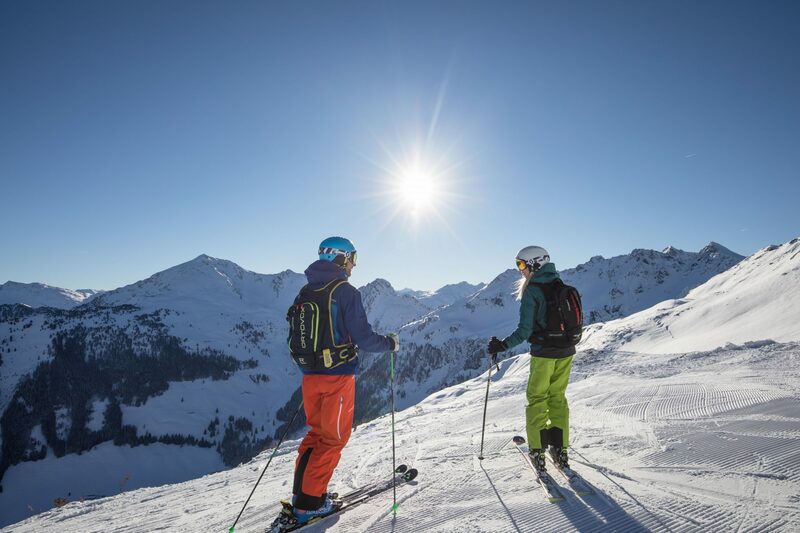 The skiing here is second to none with a big local ski area served by fast comfortable lifts but its only part of the bigger Zillertal Valley ski pass which covers 515 km of piste including the adjacent year-round glacier slopes of Hintertux. There are groomed pistes to suit all tastes, right up to the steepest groomed run in Austria, Harakiri, along with terrain parks and some to discover, along with terrain parks and plenty of freeride terrain too. Both easyJet and British Airways now offer regular flights from London (Heathrow and Gatwick) to Innsbruck all year round – perfect for an early-season ski on the glaciers. From December onwards, easyJet runs double daily flights from Gatwick starting at just £28 one-way, while British Airways flies eight times a week from Heathrow, alongside its regular Gatwick service.